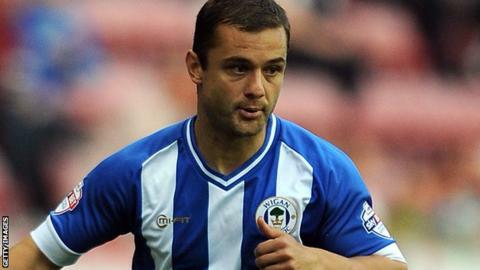 Wigan midfielder Shaun Maloney's proposed move to Premier League side Leicester City has collapsed after he failed to agree personal terms. The Latics agreed a fee believed to be just under £1m for the winger, who is out of contract in the summer. Maloney, who has 37 Scotland caps, joined Wigan from Celtic in 2011 and won the FA Cup in 2013 with the club. "He went to talk personal terms - those talks have broken down," Wigan boss Malky Mackay told BBC Radio 5 Live. "Shaun is back as my player again. I have spoken to him this morning personally. I'm delighted I've still got him. "He is here until the last day of his contract unless something else happens that changes that. "There have been another few enquiries and I know that Chicago Fire are a club that are very, very interested in Shaun." Maloney has been linked with a return to Celtic or a move to Major League Soccer but was thought to prefer to extend his stay in English football. Leicester, who sit bottom of the Premier League, have signed Chelsea goalkeeper Mark Schwarzer this January and agreed a club-record fee of £9m for FC Rijeka's Croatia striker Andrej Kramaric.